Tesla has been pushing the envelope on the amount of technology in cars since day #1 and continues to push the envelope on quite a number of topics — range per charge, size of the screen in the car (sometimes size does matter), acceleration, safety features, and more. This nicely dovetails into the feature set that is required for the next chapter of Tesla technology — self-driving technology. Tesla dropped the bomb today in a new blog post that all cars being made by Tesla today will have full self-driving hardware. This news takes the wraps off of the work Tesla has been rumored to be doing for many moons — finalizing the final hardware set that is required for full self-driving capability. What comes as a surprise is that this announcement is effective today for all Teslas — Model S and Model X — and the technology will also be in all Model 3 sedans produced. “Eight surround cameras provide 360 degree visibility around the car at up to 250 meters of range. Twelve updated ultrasonic sensors complement this vision, allowing for detection of both hard and soft objects at nearly twice the distance of the prior system. A forward-facing radar with enhanced processing provides additional data about the world on a redundant wavelength, capable of seeing through heavy rain, fog, dust and even the car ahead. This feature set is leaps and bounds beyond the technology that even Tesla was shipping in recent months, when Tesla was the clear leader in self-driving technology. Interestingly, as the new vehicles roll out with the updated self-driving hardware, they will not be capable of the self-driving features that cars with generation-1, self-driving hardware are capable of today. At first, this might seem like a bit of a mystery but it is consistent with how Tesla rolls … out software updates. Recall that, with the first rollout of “autopilot” hardware, Tesla waited many months before activating the actual self-driving features. That’s because Tesla wanted to (and did) validate what the cars would have done if the software was active. It used the opportunity to vet the hardware and the response the car would have taken in a safe, virtual (offline) environment before letting it go live with the steering wheel. Taking the same approach with the new set of hardware only makes sense, even though it’s unfortunate for initial buyers that there will be a delay while the new hardware is vetted. Having said that … wow, this new set of hardware sounds like a real step change vs. the current set of hardware. 40 times the computing power! 360 degree visibility! Visibility of hard and soft objects at twice the distance! This truly is a major improvement that should give drivers and potential drivers confidence enough to give over full control to the car when that time comes. Ladies and gentlemen, the future is coming and Tesla is bringing it. This announcement is the official stake in the sand that shows where Tesla is headed. Beyond that, it shines a clear light on the future of personal transportation — and the future is autonomous. The cars will drive themselves. Johnny Cab is going to be a reality in our lifetimes and it all starts with this announcement. Before activating the features enabled by the new hardware, we will further calibrate the system using millions of miles of real-world driving to ensure significant improvements to safety and convenience. 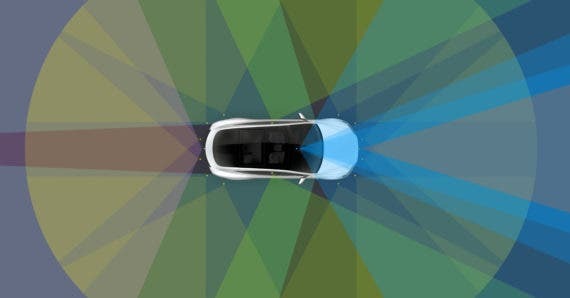 While this is occurring, Teslas with new hardware will temporarily lack certain features currently available on Teslas with first-generation Autopilot hardware, including some standard safety features such as automatic emergency braking, collision warning, lane holding and active cruise control. As these features are robustly validated we will enable them over-the-air, together with a rapidly expanding set of entirely new features. 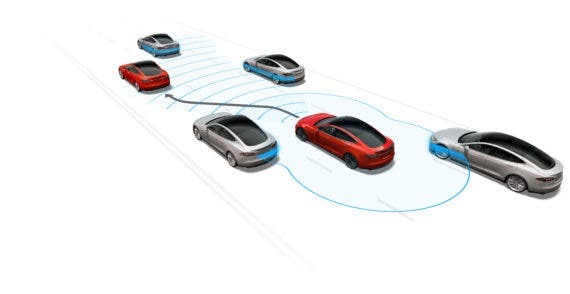 As always, our over-the-air software updates will keep customers at the forefront of technology and continue to make every Tesla, including those equipped with first-generation Autopilot and earlier cars, more capable over time.